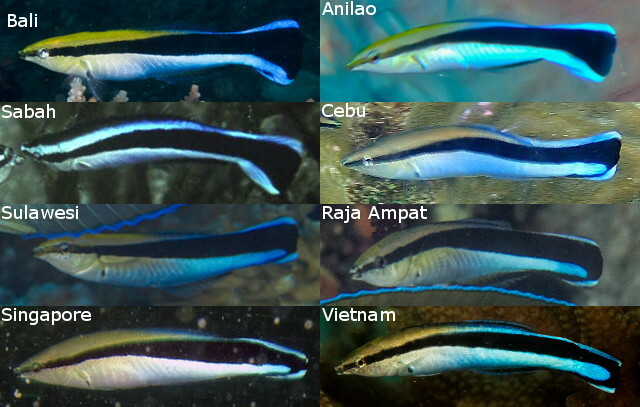 The Bluestreak Cleaner Wrasse (Labroides dimidiatus) is one of the most well-known and well-studied species of Indo-Pacific reef fish, famed for its habit of ingesting the parasites found on other fishes. 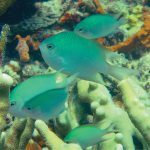 Countless scientific studies have examined the particulars of this symbiotic feeding relationship and ultimately shown that this small fish is one of the most singularly important species for the overall health of coral reef ecosystems. 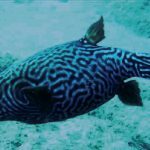 But, despite this fish’s abundance and prominence in the wild, it appears that generations of researchers may have missed one crucial detail concerning it… there is more than one species of Bluestreak Cleaner Wrasse! 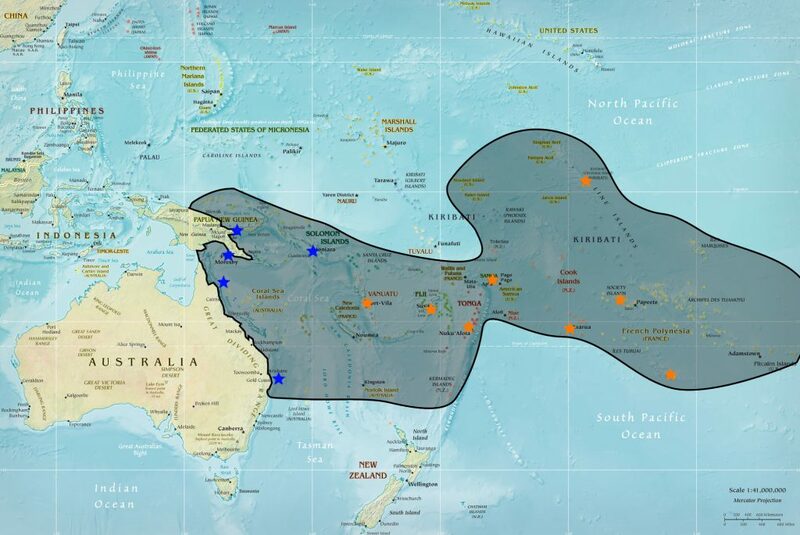 Distribution of the South Pacific population of L. cf dimidiatus. Blue and orange stars indicate the mature coloration in these regions. 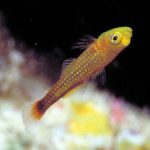 Since the last significant review of the genus by John Randall in 1958, the fish we know as Labroides dimidiatus has been treated as a single widespread species found from the Red Sea to the Marquesas and absent only from the Hawaiian Islands. It can be readily separated from the four other species in its genus based on the greater number of lateral line scales (>50 vs. <30). Perhaps because of this stark morphological difference and the relative homogeneity of this fish across much of its range, most ichthyologists have assumed there is just a single species and so, despite having been described nearly two-hundred years ago, few alternate names have been proposed since. But that’s not to say that there aren’t differences to be found in this fish upon closer examination. The shape of the black band along the sides of the body is of most importance; Sims et al 2014 examined this in great detail and found that specimens from the Indian Ocean typically have a narrower band relative to those from the Pacific, though, based on my own examination of this trait, this may not apply to specimens from the African coastline or the Red Sea. Another notable difference can be seen in the patterning of the caudal fin, where the black band may end in either a broad delta or in a distinctive U-shape marking. This latter variation has even been described as a separate species, L. paradiseus, but intermediate forms exist in most regions, strongly suggesting that this is merely indicative of a minor intraspecific variation. However, there is one region where we do seem to find just a single tail pattern, and, interestingly, this is where we also see compelling evidence of a deep genetic divide in some recently published studies. In preparing this review, I examined thousands of images of this fish in situ from across the Indo-Pacific and found that the U-shaped tail pattern is essentially absent from the South Pacific. 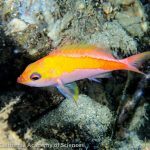 In addition, there is also a well-known difference in the coloration of these fishes, as mature specimens develop a yellow-orange blotch along the caudal peduncle which increases in size with age (though specimens from Australia appear to lack this). Another subtle diagnostic trait is the absence of a black marking beneath the pectoral fin, which is otherwise found in most specimens of L. dimidiatus outside this region. 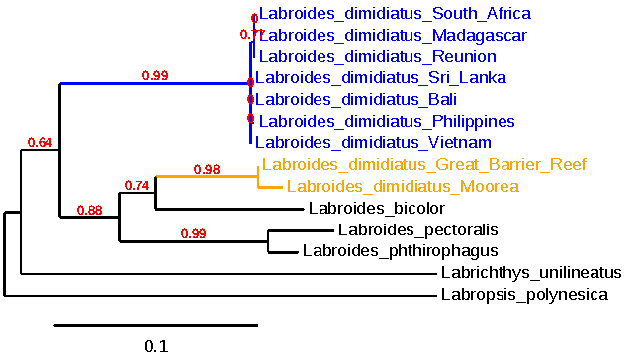 ML CO1 phylogeny of cleaner wrasses. Data from GenBank. We might conclude from this that a pair of sister species exists, with one endemic to the South Pacific and the second replacing it in other regions. Quite a few groups of fishes show just this sort of pattern of geographic speciation, but, for these wrasses, genetic evidence argues otherwise. One of the most surprising findings from Sims et al 2014 (as well as the earlier study of Drew et al 2008) was that the South Pacific population is seemingly much more closely related to other members of the genus than it is to the widespread form of L. dimidiatus. Those authors arrived at this by examining a pair of genes (one mitochondrial, one nuclear), which I’ve expanded upon by including an additional phylogeny assembled from the mitochondrial CO1 gene. 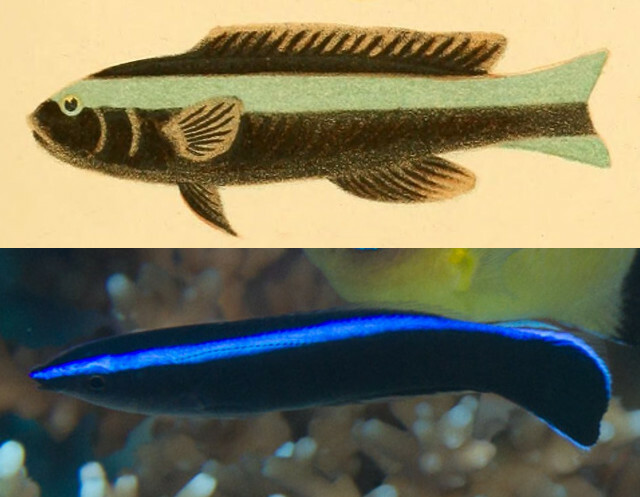 Given the consistent genetic support and the clear phenotypic differences, it seems evident that a cryptic and rather distantly related species has been hiding in plain sight in the South Pacific, masquerading as the Bluestreak Cleaner Wrasse. This raises some intriguing biogeographical questions. For instance, why is the true L. dimidiatus absent from this region when most every other widespread Indo-Pacific reef fish can be found in these southern waters. Or, conversely, does L. dimidiatus in fact occur here, but in such low numbers that it typically goes unnoticed. After exhaustive searching, the only evidence I can find for the presence of it here is a single specimen, shown below, said to have originated in the Society Islands and which clearly shows the U-shaped tail pattern. One possible explanation for its absence could be the heavier competition faced by cleaner wrasses in Polynesia, as an additional species, L. rubrolabiatus, is endemic here. Perhaps the combination of this species and the faux-Bluestreak proved too great for L. dimidiatus to maintain a presence on these reefs. 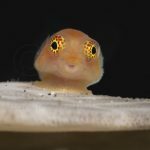 Though this does little to explain its absence from Australian waters, where it faces the same interspecific competition it finds elsewhere in the Pacific. 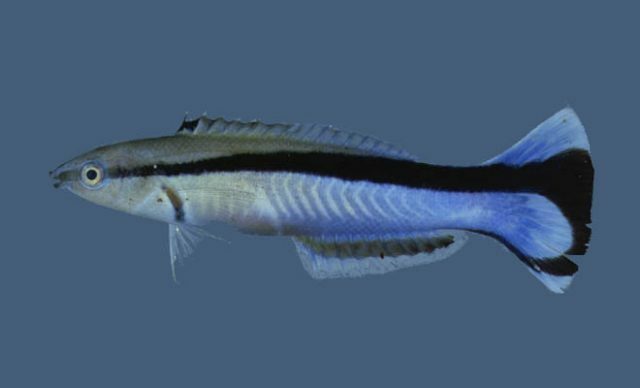 The first specimens described as L. dimidiatus were collected in the Red Sea in 1839, which means this name can still be applied to the true Bluestreak Cleaner Wrasse. The name L. paradiseus appeared in 1851 based on Indonesian specimens displaying a U-shaped mark in the caudal fin, but, since this appears to merely represent variation within a single widespread species, we can continue to treat the name as a synonym. In an early guide to Australian reefs published in 1893, Saville-Kent described a juvenile fish as L. bicinctus, named for the paired blue stripes. Since juveniles look essentially identical throughout the Indo-Pacific, it has to be confirmed that only a single species occurs along the Great Barrier Reef before we can confidently apply this name to the distinctive South Pacific population. Obviously, a great deal more work is required to tease apart what is going on with this group. 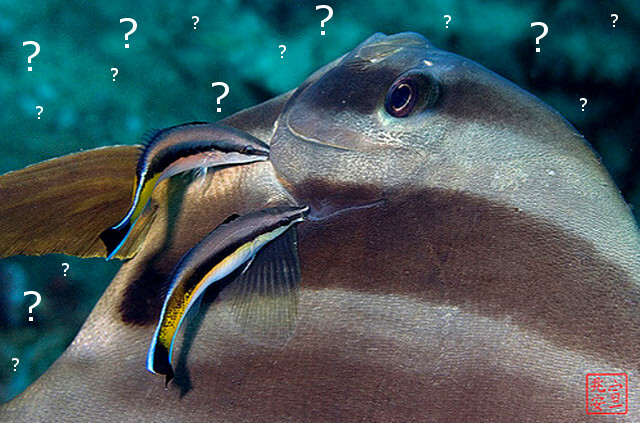 Is this Orange-sided Cleaner Wrasse really L. bicinctus, or might there be multiple populations here (e.g. Australian, Melanesian, Polynesian) which could warrant the recognition of several discrete taxa? It’s worth noting that specimens from the Great Barrier Reef and the Solomon Islands never appear to develop the orange markings seen in those from reefs further east, though they do show the characteristic delta tail patterning and the absence of a pectoral spot. Still, available genetic data links this population to those found in Fiji and Moorea. And what of L. dimidiatus? Is it truly a single “species”, or might there be subtle geographic differences here too? 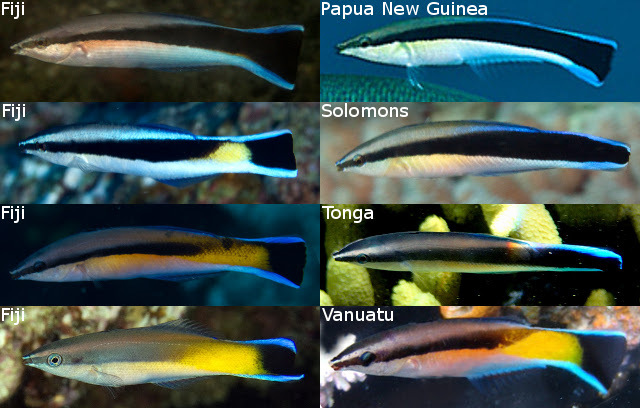 And, perhaps most vexing of all, why does the Bluestreak Cleaner Wrasse appear absent from the reefs of the South Pacific? 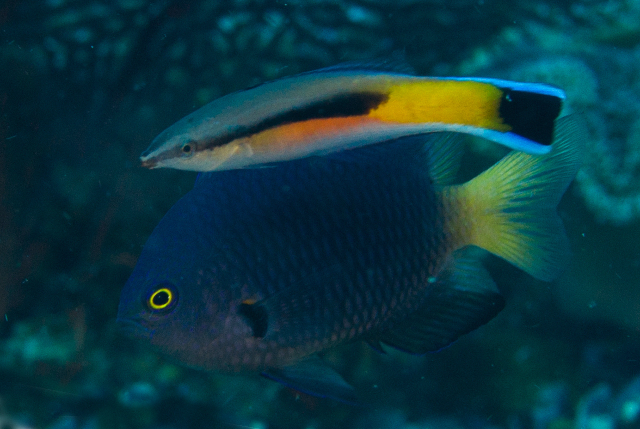 One thing is becoming clear though… these cleaner wrasses have a very messy evolutionary history.